The Illinois House has turned back a plea from the Chicago Public Schools for more time before making a pension payment of more than $600 million due by June 30. The cash-strapped school district — the third-largest in the nation — wanted 40 days to figure out a way to meet the giant contribution without making deep educational cuts. It failed 53-46, falling seven votes short of the number necessary. 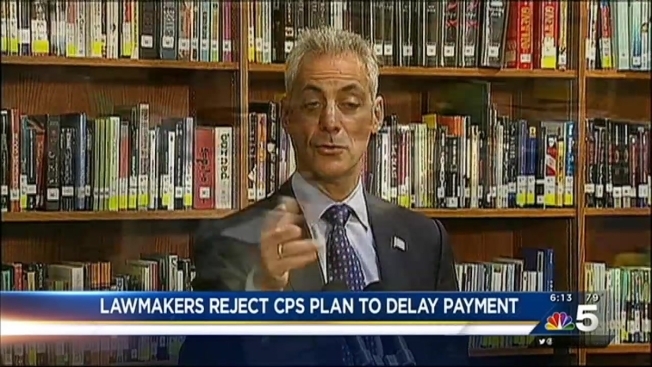 Mayor Rahm Emanuel on Monday told the Chicago Sun-Times that the district is "at the breaking point" and is unable to make the payment in full by the June 30 deadline. House Majority Leader Barbara Flynn Currie — a Chicago Democrat — says the legislation would delay the payment until after summer revenues arrive and give school officials a chance to come up with an alternative financial plan. Interim schools CEO Jesse Ruiz told lawmakers that drastic schoolroom cuts could be necessary without a delay.